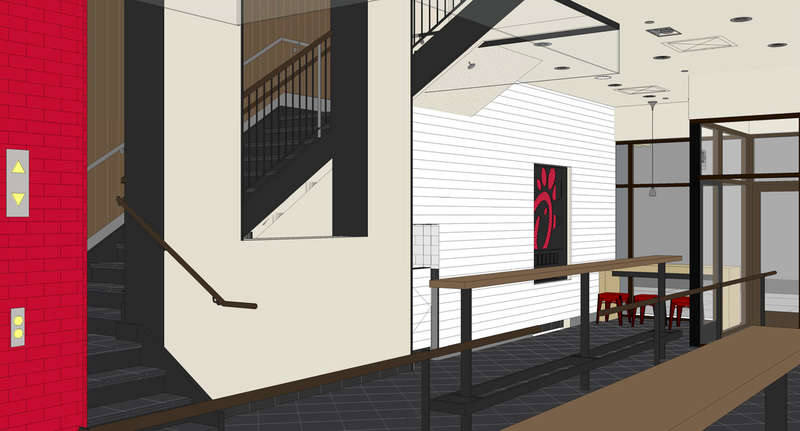 Restaurant will have signature features never seen before at a Chick-fil-A. The restaurant location came with some of the most unique challenges the company has ever faced. But those challenges led to several firsts – including design elements that have never been featured at a Chick-fil-A restaurant. One such comfort: natural light. Chick-fil-A Fulton Street is in the middle of a city block, unlike the first two Manhattan restaurants (37th and 6th, and 46th and 6th) that are located on corners. That means the Fulton Street space is naturally darker because sunlight doesn’t easily pour into the building. But the design team didn’t let that stop them. Cates says it’s extremely rare for mid-block sites to have skylights. They’re rare in Chick-fil-A restaurants too – only three of the company’s more than 2,200 restaurants across the U.S. have skylights. In addition to the skylight, the Fulton street restaurant will have floor-to-ceiling windows on each level and brightly colored interior finishes. Starting on the second floor, there is a window that also spans the second and third floors, allowing natural light to flood in from the rear courtyard. To tie the five levels of the restaurant together, a signature monumental staircase will extend from the fourth level to the ground floor, accentuated by the skylight. 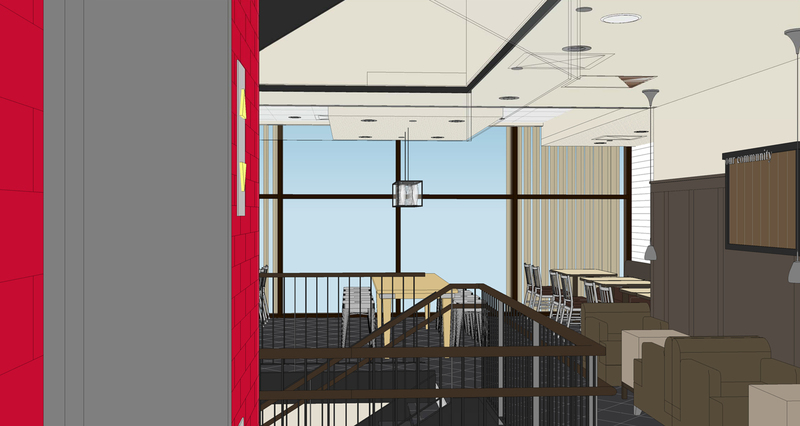 Cates says that, together with the skylight, the staircase will make a big difference by letting customers know there is dining upstairs, enough seating for 140 guests. With no neighbors upstairs since Chick-fil-A occupies the entire building, the team was also able to add a rooftop terrace. From the rooftop, guests will be able to take in unimpeded views of One World Trade Center. That will never change, Cates says. Inside on the uppermost floor, Cates’ team added yet another first for Chick-fil-A restaurants: a bonus multi-purpose section of the dining room that is semi-private and can be set up to reveal white boards and cork boards for group trainings or meetings. 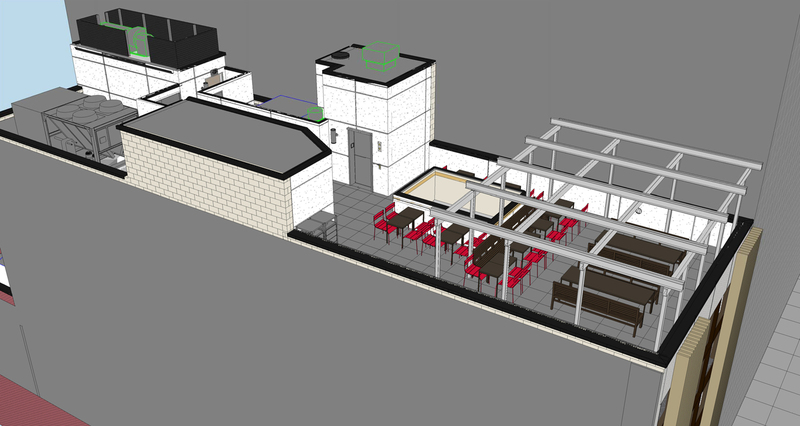 Designed with the Operator’s restaurant team in mind, the space may be available for other groups in the future, too.